Now you know those cute little bone and heart-shaped dog ID tags hardly have enough space for your little guy's name on them, never mind his address and phone number! Those dog tags will do if he's just run to your neighbor's garage and you're available to pick him up. But suppose you can't be reached, or your dog followed the trail of a skunk who's now three miles away, he's injured, or has allergies to certain foods or medications... Maybe he is blind or deaf, and the only person who knows all this stuff, you, is not around? Dog-e-Tag® to the rescue! Dog-e-Tag has enough space for Fido's biography, if he's interested in publishing it! 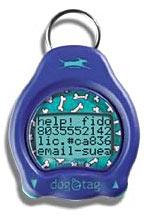 The Dog-e-Tag is the first battery-powered digital identification tag for dogs (pets). It has enough room for 40 lines of information (400 characters) in five different languages - English, French, Spanish, German and Italian. In addition to your pet's name, address, phone numbers where you can be reached, email, veterinary, allergy, and friend's phone numbers, you can also enter information about what your dog likes: "I love to play ball." "I like to hide under newspaper," etc. Knowing this can help her rescuers know how to relieve her stress until you arrive. Dog-e-Tag weighs less than an ounce and has a 1.75" circumference. It is waterproof and shockproof, and the lens is scratch resistant. It has a high resolution screen and backlight for easy reading. It uses a commonly found battery and has a low battery indicator light. Dog-e-Tag's content can require a personal identification number (PIN) to change information. It comes in a variety of colors to match her other apparel (oooh, buzz!). Why target the just the dog market with this device? Yes, it seems these tags should also be used on cat collars; but humans with serious allergies and/or medical conditions should also carry or wear a similar tag. What good are medical alert tags for people with illnesses, when they don't reveal the exact condition or allergy the person has? Someone should get these going, don't you think? If you like this article, I'd really appreciate your help. Please vote for it on DIGG, Stumble, Deli.cio.us and the other great sharing sites. I can see the advantages of having this information readily available (e.g., lost pet; accident/emergency), but there is a "dark" side. Handed the pet's name, medical history , and list of likes/dislikes, etc., pet thieves will be able to act as though they are the rightful owners and take full advantage. They will even know IF the dog is free of medical problems and thereby worthy of stealing! I also do not believe these tags will save the owners from having to repeatedly provide the same information--doctors and veterinarians alike want to VERIFY that the information is CURRENT and that nothing of significance has changed. I believe I've seen this idea presented before, but I don't know if the person who THOUGHT of it is reaping the rewards. This ingenious device may be just the thing some pet owners, who are put off by the thought of implanting a microchip under their pet's skin, have been looking for.